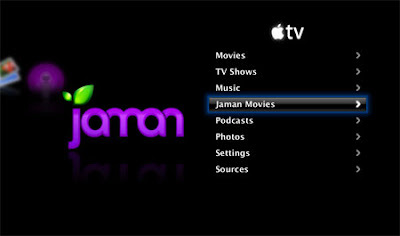 JAMAN, a P2P movie download company that focuses on indie and international content, has found a way to install its service on AppleTV. Jaman offers both rentals and downloadable purchases, and copyright-protected status will remain in place when content is viewed on AppleTV. Video quality of the downloads is said to be "stunning" compared to videos purchased from Apple. The software will be released within the next few weeks. So basically Jaman have worked out a way to 'unofficially' offer their content on the Apple TV closed set-top box solution. Wonder if this will get booted? If it doesn't almost make it worthwhile to buy an Apple TV which I've resisted until now. (also wonder how many calls Jaman have had this week to 'license' their hack to other content vendors). P.S. For anyone who watched Studio 60 last night and didn't think it's the biggest mistake in Television that they aren't bringing this show back...you are heartless and have no taste. I cant believe this isn't getting the greenlight for a second season.